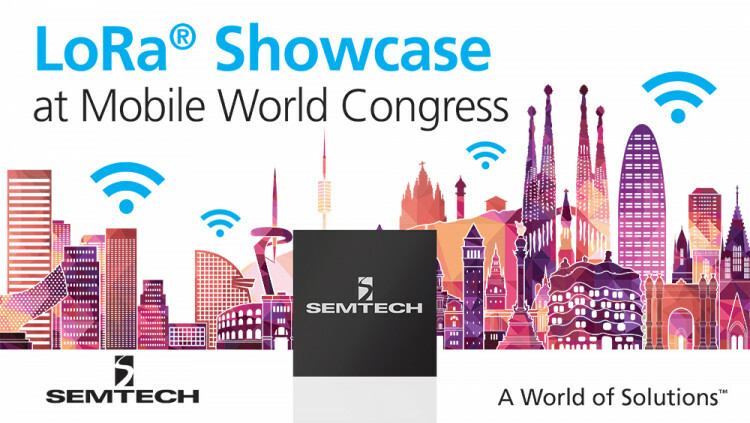 Semtech Corporation (Nasdaq:SMTC), a leading supplier of analog and mixed-signal semiconductors, today announced plans to showcase its award-winning LoRa® devices and Wireless RF Technology at Mobile World Congress in Barcelona, Spain on Feb. 27-March 2 (Hall 8, Stand D3). Together with companies from the LoRa Alliance™, Semtech will demonstrate its LoRa Technology and the broad range of innovative, next-generation IoT networks, gateways, sensors, module products, and services it enables. The show is open Feb. 27 to March 2 and is located at two Barcelona, Spain venues: Fira Gran Via and Fira Montjuic. The LoRa Alliance IoT Pavilion is at the Fira Gran Via. Contact meetings@semtech.com to schedule a meeting with a Semtech representative.